"The Most Amazing Restaurant, Bar & Lakeside Entertainment Venue You Will Find In Northern Illinois!" 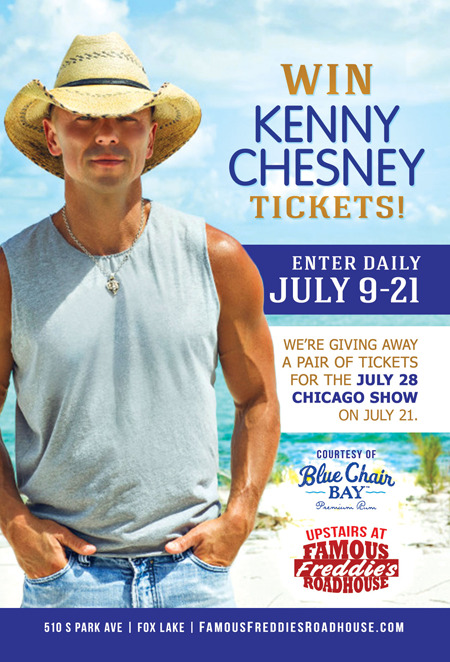 KENNY CHESNEY live at Soldier Field on Saturday July 28th. Stop by to enter everyday starting July 9th and sign up to win a pair of tickets. The more you visit, the better your chance to win! The winner will be drawn at the final party on July 21st. Freddie's offers both indoor and outdoor waterfront dining. In the spring & summer, our outdoor patio/bar area is in full swing. Offering a delicious array of “just off the grill” specialties, Freddie's is the perfect place for an al fresco get together for drinks, lunch, snacks or light dinner! Famous for its delicious inexpensive eats, served up fast and hot from the express kitchen. Accessible by car or by boat, Freddie's has free parking and 100 slips for boats of all sizes. Invites to Exclusive Events & More! !